No matter what phase you are in – changing diapers dozens of times per day, chasing a strong-willed toddler around that never seems to understand the word “No”, running your elementary aged children from one activity to the next, or trying to keep up with your teens and their crazy social media accounts – it can be very overwhelming at times! Some phases of life may be more mentally, or physically, draining than others; but it is all wonderfully hard work. As a mother of three children ages 10 and under, I have learned the importance of self care – especially self care for busy moms. I used to feel like I met everyone else’s needs all day long, only to collapse in bed and feel completely unaccomplished and unfulfilled. I was drained. I was not taking care of myself, and it began to take a toll on my health. After some life changing “Aha” moments, I realized that I could do little things for myself throughout the day. Not one of these took up a lot of time, or cost much money, but by doing little things throughout the day I found myself becoming happier and a much better parent. By meeting my needs along the way, I have been able to give back so much more to my family. Instead of my husband being just one more person in the house to check in with, we are enjoying our relationship again! I love my husband so much, and I appreciate that he continues to help me through each stage of parenthood, AND now also encourages me to take care of myself daily. By taking just a few moments for myself, I am in return a much calmer and patient parent. I have more energy to give my kids, my relationships, my friendships, and even my work; and it feels absolutely amazing! 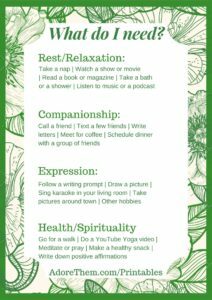 Here are a few suggestions of little things that you too can do throughout the day to give yourself some much needed, and very well deserved, self care! 1. If you are a morning person, consider setting your alarm for an extra 20-30 minutes (or more) earlier, and enjoy your first cup of coffee or tea in peace. I am not a morning person, so I typically do not get up until the first child needs to be up for school. However, I always find a few minutes of alone time to sip on something warm, even if it is just while driving in the car. 2. Turn on your favorite radio station, play list, or some spa-like music. Music truly has such an incredible effect on our moods! So find something you like and crank it up while making breakfast, packing school lunches, or getting dressed for the day ahead. 3. Treat yourself to one of your favorite breakfasts. Each week I make delicious mini banana and apple muffins. I keep them in the fridge all week, but heat up a few each morning with some melted butter – absolutely delicious! 4. Take a few minutes to pray or meditate. By releasing all of your worries and stress, you will feel so much lighter! 5. Check out @_Adore_Them_ on Instagram for a daily inspirational quote, or look for other positive affirmations that you can focus on each day. By reading uplifting content early in your morning, it can really shift and benefit your focus and attitude for the day! 1. Read a good book, even if it is just a few pages. I keep a book in my car at all times. Between car-pool lines, kindergarten readiness classes, speech therapy, dentist appointments, etc; I can usually find a few minutes (or hours) in my day to read something I enjoy. 2. Take a bubble bath. Depending on your work schedule, this might only be accessible on the weekends or at night. 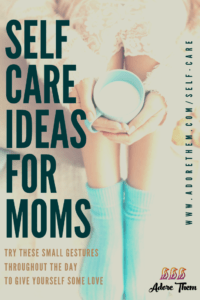 But if you work from home, or are a stay at home mom, a bubble bath can be the perfect relaxation and self care to get you through your day. 3. Play with a pet, or cuddle something soft. There is something about animals that can instantly calm us down. Or the next best thing could be to cuddle up in a soft or weighted blanket for a few minutes. 4. Take a nap. Even if you work in an office all day, try to sneak out for a mental break. You don’t need to always fall asleep, but a few minutes away from your work can actually reset your mind and re-energize your body. 5. Take a walk and gaze at the clouds. Remember when you were a kid and would lay on the grass watching the clouds roll by while changing shapes? That was almost hypnotizing! As an adult we can still do the same thing, and take a few minutes to enjoy the beauty around us. I often find looking at nature very peaceful and humbling. 1. Work out. I don’t do this everyday, but my goal is 3-4 times per week. Trying a high intensity group fitness class can really help with aggression. Yoga or swimming can relax and stretch you, a run outside can calm you, and there are so many wonderful options in between! 3. Turn off your phone. Once my husband and kids are all home, I often turn my phone on silent and leave it in another room charging for an hour or more each evening. This allows me to focus on who is in front of me, or on what I am doing. Not only am I more productive, but I can feel my mind instantly begin to calm down. 4. Get creative.There is something about getting creative that often transcends me into another mindset. But if I am not feeling crafty, a puzzle can be very enjoyable as it doesn’t take much brain power. Journaling or coloring can also be wonderful outlets. 5. Snuggle. Whether it is just you wrapped up in a blanket in a comfy chair with a glass of wine, or getting close with one of your precious littles on the couch, or sitting beside your partner; physical closeness can really help us feel loved in a genuine way.